Ever since I was a little girl, one of my favorite characters of all time has been Mr. Tumnus from The Lion, the Witch, and the Wardrobe. Aside from Aslan and Lucy, he is my favorite Narnian hero and out of other books, he remains a very beloved favorite. Tumnus is an intriguing character to me, because he is very relatable. He’s very human in many of his struggles and his choices. He’s afraid of the White Witch and because of this, he plans to kidnap Lucy as soon as he sees her in order to gain favor with Jadis. Because of his fear, he makes a terrible choice. Once he spends time with Lucy, he realizes what a horrible thing he’s done. He tells Lucy the truth and ends up saving her life at his own expense. Tumnus has always seemed a tragic hero to me in that when he makes the right choice, there are harrowing consequences (SPOILER ALERT: he is turned to stone). C.S. Lewis doesn’t shy away from illustrating the fact that even when we make correct choices or when we stand up for what is right, sometimes there may be persecution. 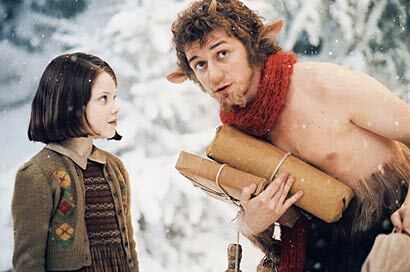 As a child, I always wanted to meet Mr. Tumnus. I felt then, as I do now, that he would be such a fascinating person to speak with. I’d love to know what was going though his mind when the Witch found him and turned him to stone. Would he have wished he’d turned Lucy over to her? Would he have been glad of his choice even with the Witch’s punishment? I like to think he would have held onto his honor. I imagine him as a faithful servant of Aslan. Who’s your favorite Narnia character? Are you a Tumnus fan? If so, what made you like this courageous faun? Share your thoughts in the comments!